This morning is a bit gloomy and rainy and not nearly so cold (or sparkly). I'm so grateful for digital memories I can share! I sold nine photos at the fundraiser Saturday evening, my first time selling photography, so I feel quite happy about that. As to be expected, my progress is very slow, while weaning from the Gabapentin (I only have to take it for three more days then I'm done), but I am able to be up and about a little more each day. In fact I walked 770ft at PT last Wednesday with my walker...and short standing breaks (as opposed to sitting breaks) on my stroll around the gym. This was pretty amazing, I cried from exhaustion and joy briefly, rested, then did some pilates. I have to keep my core strong. I will see my neurologist on Thursday and she'll decide if I should stay on the Tysabri or switch to pulse steroids. Slow improvement, in small increments seems to be my pattern over the past two years. Five - seven months mostly out of commission then a month or two fairly mobile. So was it the Gabapentin creating toxicity (I think a likely contributor) or just the way MS plays out in my body (maybe a little of both)??? I don't know for certain, can't know, but it has been four months of mostly bedrest again so it seems like it is nearly time for renewed mobility and energy soon. Not that diseases have schedules or timetables like the ones we humans invent...an illness just does what it does and we figure out how to be with the experience the best way we can. Meanwhile, I get to view the world through raindrops and frost, and soon snowflakes...and I really SEE it, you know? I'm blessed to have time to just observe the beauty of the world. Dazzled is the perfect word for these photos! 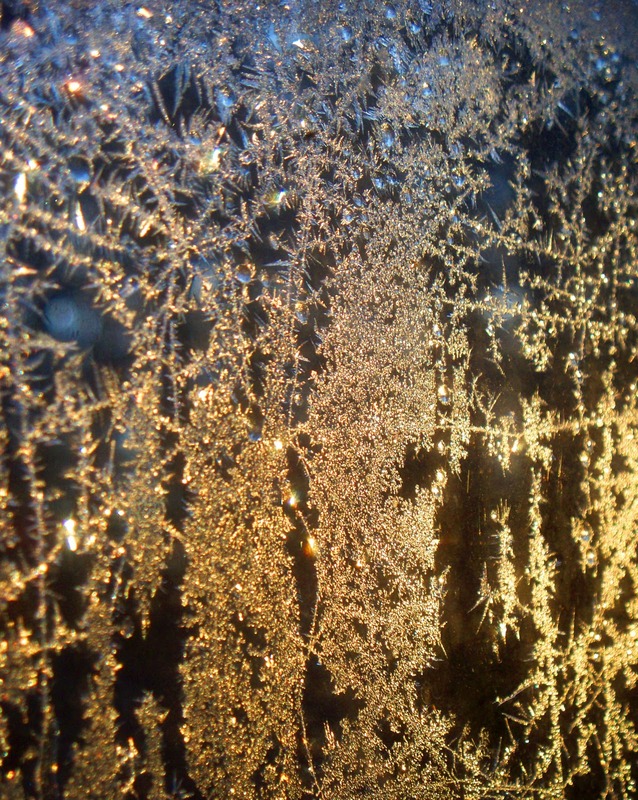 I love frost on a window. Bravo Laura, I love these. Jack Frost paints with a glorious brush and your lens captured the beauty, Laura. I love to see through your eyes. oh that we always remember to really see. love to you... may this be the beginning of a long long cycle of well. Oh Laura these photo's are beautiful. How awesome that you sold 9 photo's! Your thoughts and attitude come to me as a gift because I am reminded to just "be" in this moment and take it all in. My pain levels have been really high these past few days so it has been more of an effort to be mindful of all the good that surrounds me. Seeing through the eye's of pain does cause me to really appreciate the things I can do, even if it's just enjoying the smiles on my little's faces or a phone call from my granddaughter. 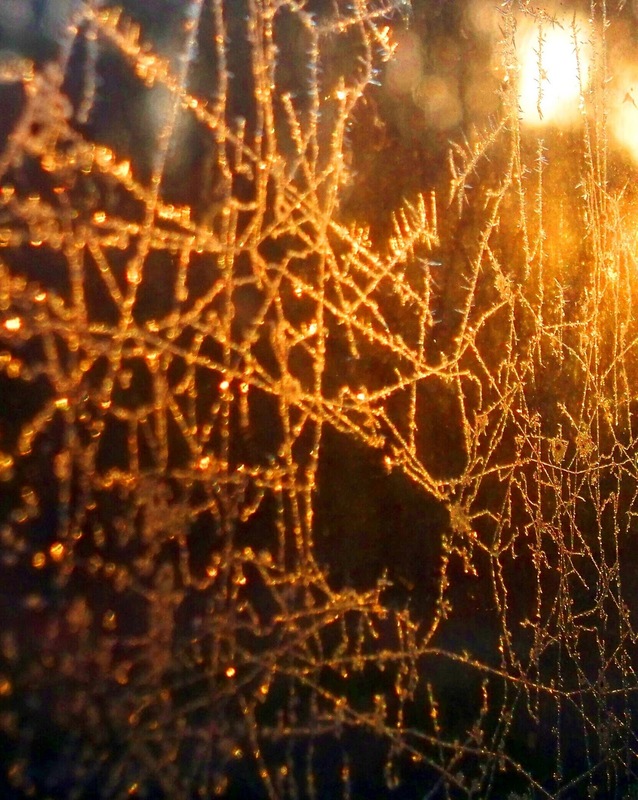 Frost is so beautiful, isn't it? Gorgeous images, just beautiful--thank you! great way to wake up!! Lovely to behold! The ability to see the wonder of things so close...The gift of being able to be still enough to really see. This is a joy and I am glad you were able to share it with us. I am sorry about the conundrum of your MS. How do we treat is? What is the best course of action that causes the least amount of side-effects? So much of it is hit or miss and can be absolutely maddening. How did you figure out that the Gabapentin was creating a toxic effect on you? I am so happy that you are going to be off of it very soon, so that your body will be able to flush it out of your system. Please wish your beautiful Rosewillow a very, very happy belated Birthday for me. The post you wrote for her brought tears to my eyes because I understand that kind of love. She is growing up with the precious gift of a mother who is an angel on earth. The example has definitely been well-learned. She is a beautiful, beautiful girl both inside and out. You've done good, Momma!!! Please know that you are always on my heart and on my mind. 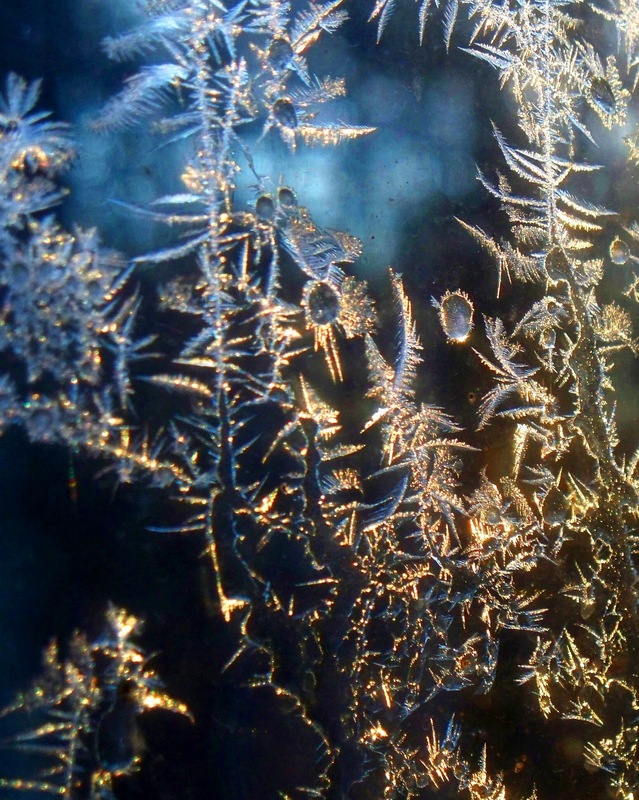 Gorgeous details of the ice crystals in these images. Glad you got up early to shoot these! Wow....these photos are so very impressive. Thanks for commenting on my blog. That's a terrific capture. They are all beautiful!!! Thanks for sharing and have a wonderful day. wishing you lots of strength and good health! not that it's stifling your creativity though, these shots are stunning! 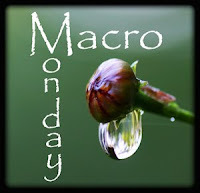 Thank you for sharing those stunning crystalline images! You have a strong and positive attitude, and one full of gratitude fot the hidden and difficult blessings of illness. Hope your energy sparks within your body, the way it does within your mind and spirit. Those are amazing photos! I'm tickled for you that you've sold some of your work. Photography is just one of your many gifts. Glad, too, to hear there's some physical improvement. Your gratitude and optimism are such blessings to me. Love these.... so sorry it is cold enough for these beauties to form though. You are an inspiration! These are gorgeous photos, you've created some amazing art pieces of these ice flowers. You are blessed that you can see beauty even in difficult moments. I'm so glad your health is improving. we call them "frostroses". I have a window where they form. But sadly enough it is a 3-glass window. And it forms on the outher glas. You have got som pretty nice light on these. The frost is so beautiful on your window! For some reason I am reminded of "Fantasia." I am glad you are feeling a little stronger and are able to walk more now; I pray you will continue to improve. 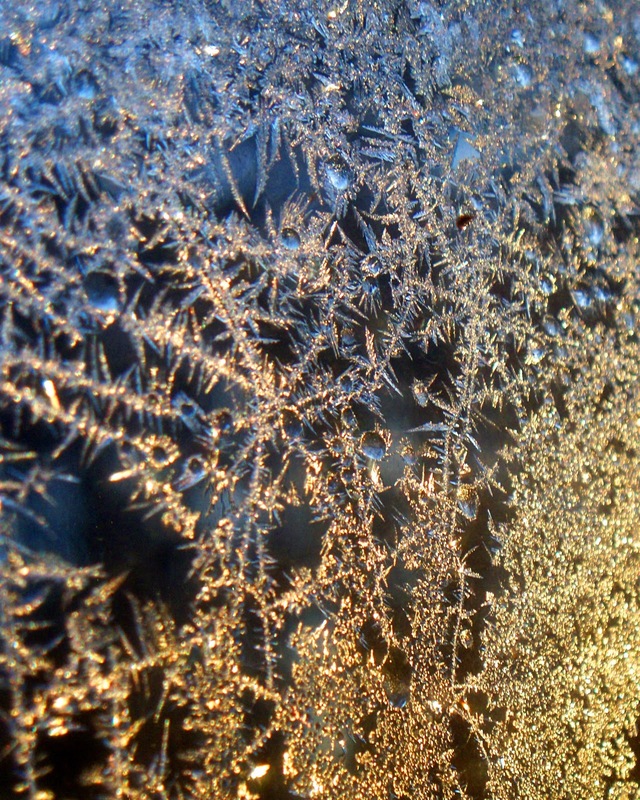 The ice crystals are stunning! Were they difficult to take? I was trying to take pics of prism rainbows yesterday and couldn't quite get what I wanted. 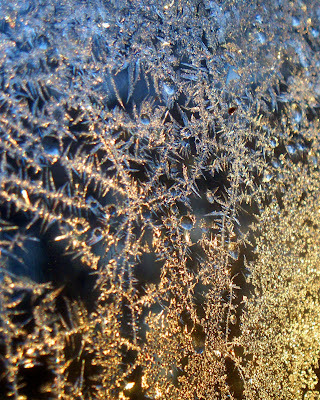 Your ice crystals remind me of the "Messges from Water" work of Masaru Emoto. Maybe these beautiful crystals were sending you love from all the prayers and kindnesses of the friends who care about you? I like to think so. Congratulations on selling so many of your photos! That's awesome and makes me happy that others will be able to appreciate the beauty you capture through your lens. "An illness just does what it does and we figure out how to be with the experience the best way we can." - I'm deeply honored to walk this experience in some small way with you. I just "saw" us arm-in-arm, dressed in warm coats, walking slowly and companionably together. You are so gifted at obseving the beauty of the world. ...I no longer live in the North Country where there's frost heavy on the windowpanes so you've also given me a wonderful memory. Marvelous photos! Cold but beautiful! Since I've always lived in a warm climate, I've never seen frost crystals on the windows. So glad you captured and shared their stunning beauty.